Sift together 3/4 flour, salt and pepper. In a large sauté pan or stock pot heat GHEE and oil. Dredge chicken pies in flour and place skin side down in hot oil. Brown chicken skin side down until chicken starts to bleed before turning, about 15 minutes per side. Remove chicken pieces to plate. Add carrots to pan and stir for a couple minutes. Add celery and shallots, stirring a couple more minutes. Add garlic and 1/3 cup flour stirring constantly until flour is golden. Gradually add chicken stock, constantly stirring until well blended. Add wine, vinegar, sugar and peppercorns and bring to a boil. Once boiling, reduce to a simmer, covered and cook for 15 minutes. While the stew is simmering shred chicken from the bone into bite size pieces and begin the dumplings. Be sure to shred crisp chicken skin into bite size pieces also. In another bowl whisk together the butter and milk. Add basil, chives and red onion to milk and let sit 5 minutes. Gradually whisk in the dry ingredients JUST until combined. Skim any fat from stew. Add the chicken pieces and crispy skin back into the stew. Drop dumplings on top of stew and simmer covered another 15 minutes or so until dumplings are plump and cooked through. 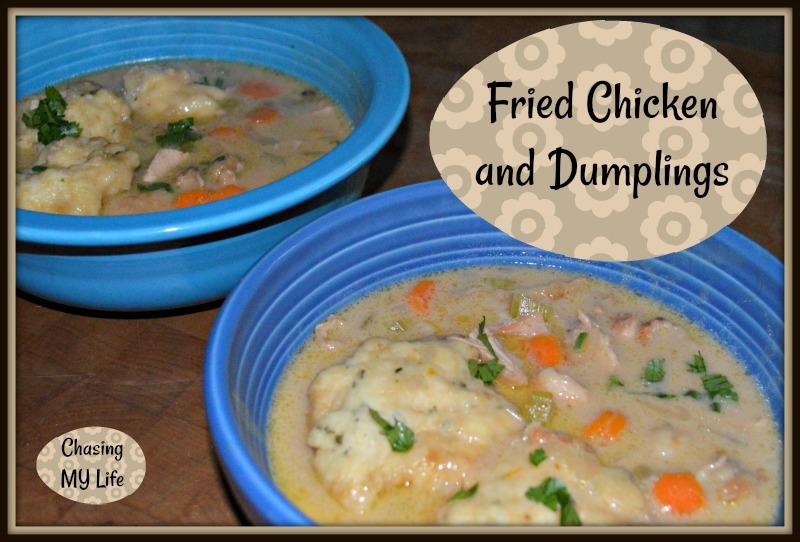 Your Chicken and Dumplings look amazing! Thanks so much for sharing with us at our Thanksgiving Edition of Full Plate Thursday! Hope you have a great week and come back soon!